THERE is no better sound in the world to Hally Herrmann than the patter of rain on a rooftop. 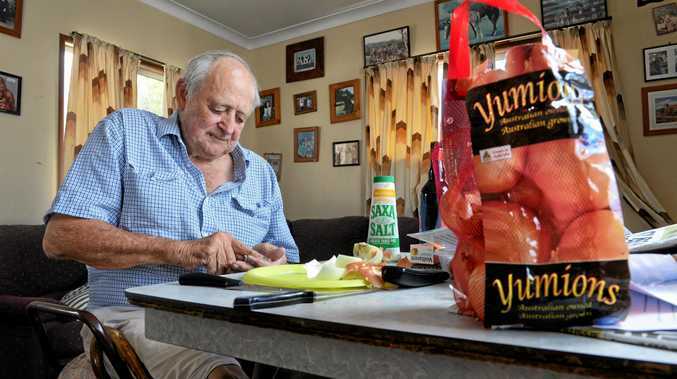 The Onion Oracle from Lowood has been predicting the weather with the use of the humble vegetable and some table salt for 60 years. It is an old German tradition he practices every New Year's Eve so he can put together his own outlook for the upcoming year. Keeping it in the family, his grandson Luke has begun taking part now too. The weekend's downpour proved true his prediction that March would bring with it 'good rain'. "We had four inches in Lowood. I'm really happy we got our rain," Hally said. "It's the best rain we've had since December. It's been a blessing for us. Our prayers were answered." He believed more rain was on the way this month but it would drop off in April and May before a dry June. Hally said he did not believe there to be any flooding in 2019. "There is another change coming through and I still think we get rain out of that on the weekend," he said. "Something from (Cyclone Trevor) could come our way too. We need more to get some grass and feed. I'm quite happy with the rain. It's a big help. "We need more rain so we can get some grass for the winter." As soon as the rain begins to fall, the grandfather's phone doesn't tend to stop ringing and he said the relief after months of dry conditions brought the community together. "There are lots of people interested in what I do," he said. "I don't get any money out of it. It's just fun for me. My forecasts are up in all different places. I'm quite willing to put them out. I've only done it for 61 years." His predictions for the rest of the year include: April (some rain), May (some rain), June (dry), July (some rain), August (some rain), September (dry), October (dry), November (some rain) and December (dry).